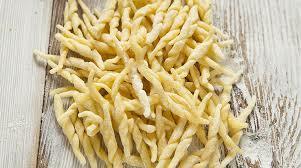 Native to Liguria in northern Italy, Trofie are a twisted, spiral-shaped type of pasta. Their story speaks of women seated at the kitchen table rhythmically modelling, one by one, with a swift and expert gesture of the palm of their hands, hundreds of little twists of fresh pasta. The perfect pairing for Trofie is pesto from Genoa.